I'm so happy to have Pam back this week with another fantastic quilting tutorial. I love this project so much since it so quick to go from fabric shopping to finished project. 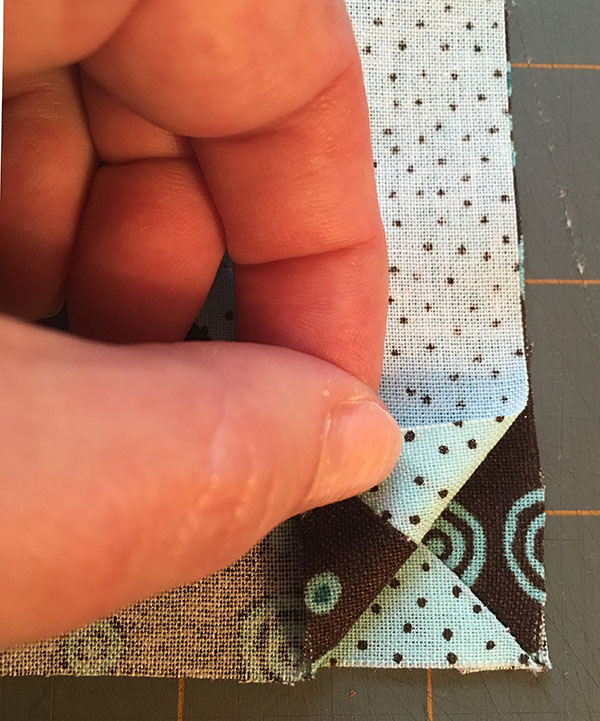 If you are are scared to take on a whole quilt, or just want to try out her trick for half square triangles, this is a great way to get your feet wet. Make sure you check out Pam's (and my other contributor's) other posts for more great tutorials just like this one. And don't forget you can find Pam regularly on her blog: Leaves & Stitches, as well as on Facebook, Instagram and Pinterest. She is a great quilting teacher and I'm so thrilled she is here! Hi everyone! 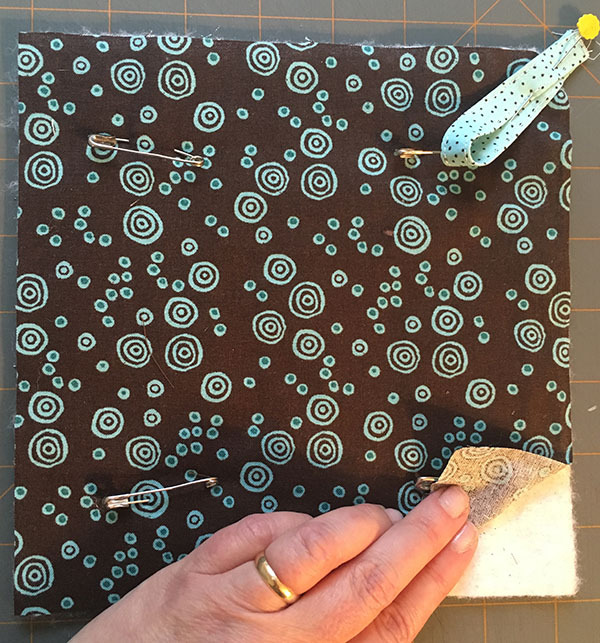 It's Pam from Leaves & Stitches again, back with another quilting/sewing tutorial. But first, a confession: I love the look of quilts and projects made with half-square triangles, but I hate cutting out all those little pieces. And sewing all those little pieces together with a 1/4" seam allowance on the bias? My sewing machine and I BOTH have issues with that one from time to time. So I went looking for a simpler construction method and I found one that is GENIUS. 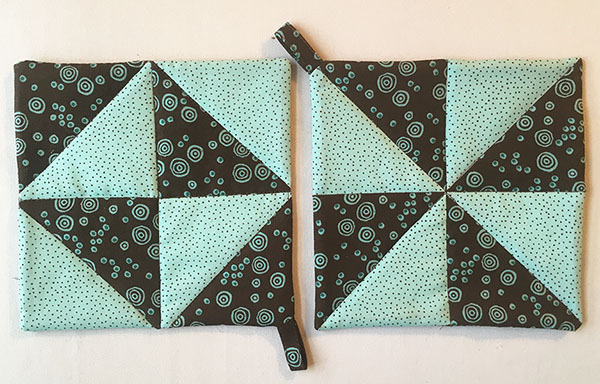 If you've never worked with half-square triangles, these potholders are a great beginner project. 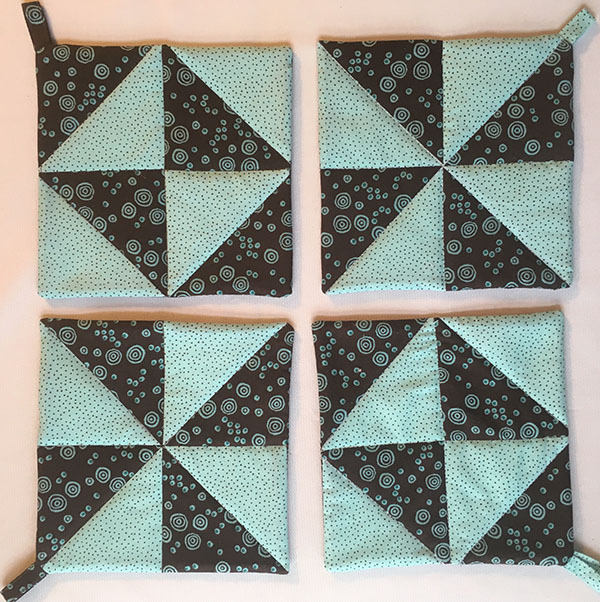 The blocks aren't very complicated and there are just a few seams to align, the pieces are big enough to handle easily, and the assembly method eliminates so much of the fiddly-ness that goes with making half-square triangles one at a time. If you're already a half-square triangle pro, you can probably knock these out in an hour. I used two different prints and made four 7" potholders at one time. 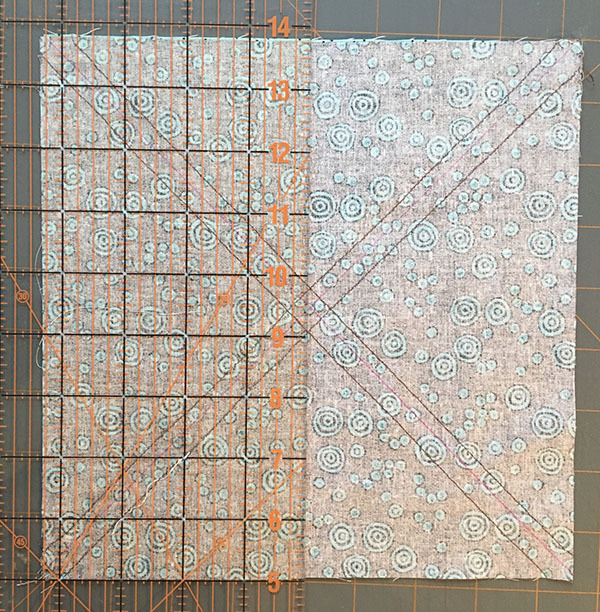 You can use fat quarters (you'll need two each in two colors), full fabric (1/3 yard each of two colors) or scraps, as long as your pieces are at least 9" square. You'll also need 1/4 yard of Insul-Brite or similar insulating fleece. 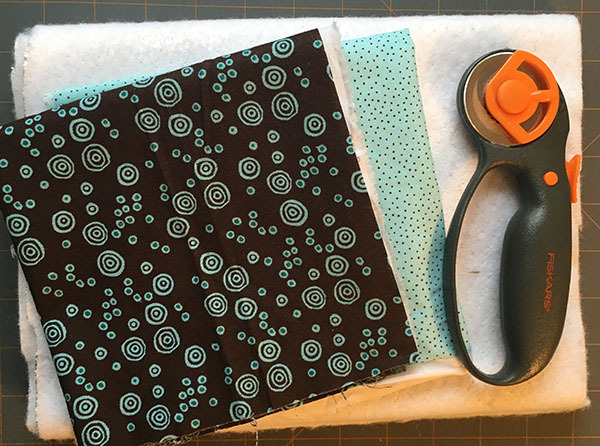 To make cutting and sewing easier, I used the "magic 8" method. You can find a full tutorial on how to calculate and make blocks here, but I'll talk you through all the measurements needed for this project. 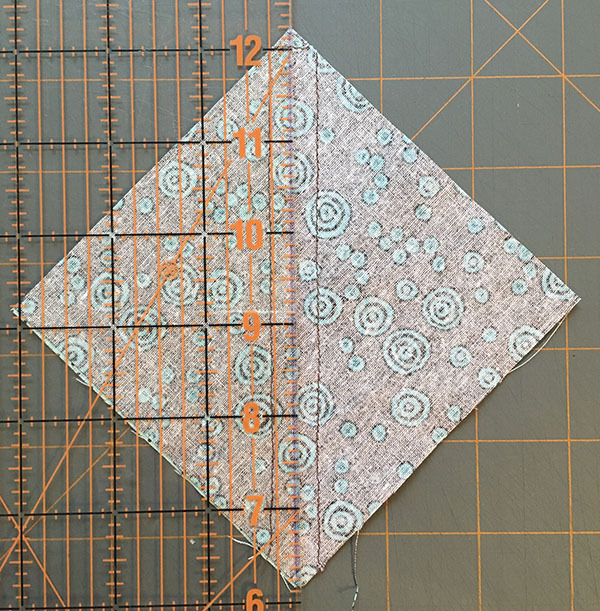 Cut two 8-3/4" squares from each of your two fabrics. Pin two squares (one of each fabric) together, right sides facing. Draw diagonal lines from corner to corner, then stitch on either side of both lines with a 1/4" seam. Cut the stitched squares in half horizontally. Cut the half-squares in half vertically. Cut the quarter blocks along the original drawn diagonal line. Ta-da! Eight identical half-square triangle blocks without actually cutting out any triangles. I told you this method was genius. 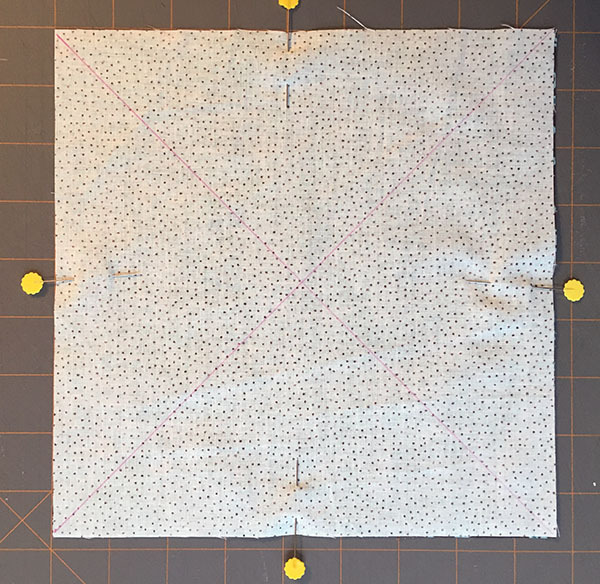 Repeat the process with the remaining fabric squares, then press all your seams and trim off the little tabs at the corners. 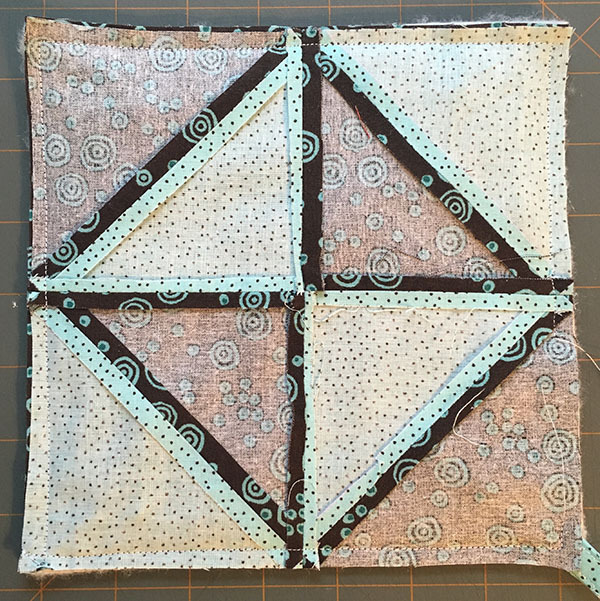 TIP: Since your blocks are sewn on the bias, they will stretch. Be careful you don't stretch and distort them when you press. Lift the iron, move it, and set it back down on the fabric rather than sliding it along the seam. Once all your blocks are pressed, you're ready for the fun part! Grab four blocks and experiment with layouts until you find a design you like. I came up with 9 different possibilities just by rotating the blocks, and there are probably more. Once you have a layout you like, pin two blocks together, right sides facing, making sure the seams are lined up. Sew the blocks together with a 1/4" seam. Repeat for the other two blocks, press the seams, and join the two resulting strips to create a four-block square. Press one last time. Repeat the assembly process with the remaining 12 half-square triangles, creating four finished blocks in whatever layout(s) you like. 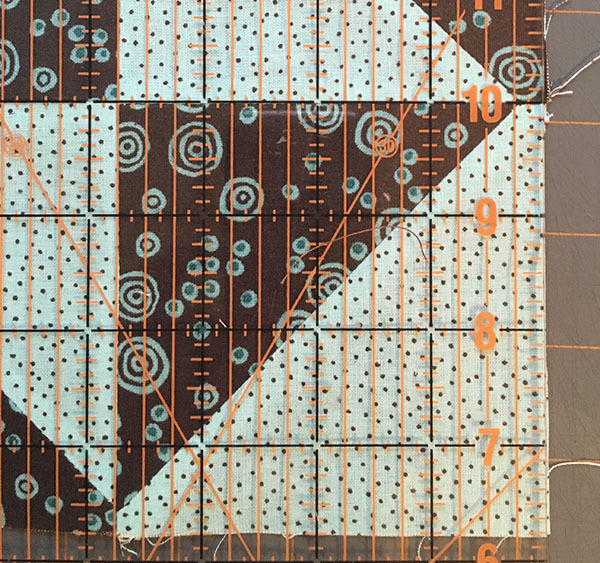 Once all your blocks are assembled, grab a quilting ruler and square them up. Using the trimmed blocks as a guide, cut a square of Insul-Brite and a square of backing fabric for each. If you want to add hanging loops to your potholders, now's the time to make them. 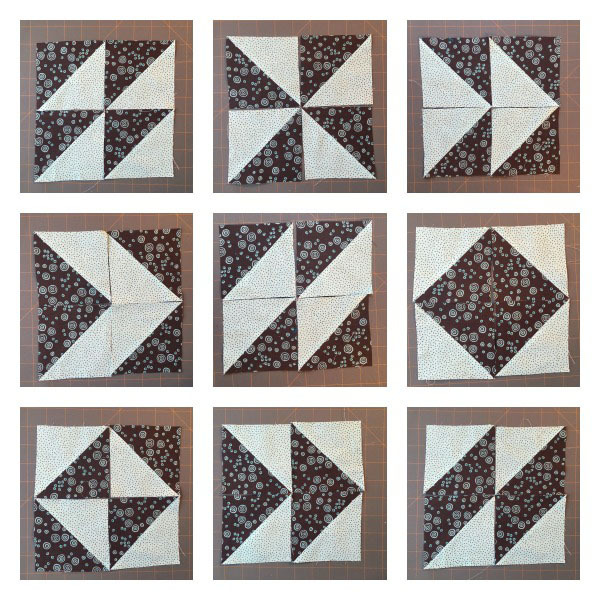 Cut four strips, 1-3/4" x 6" each, from your block fabrics. Fold each strip in half, wrong sides facing and long edges together, and press to mark the center line. Open up the strips and fold the long raw edges to the center line, press. Fold the strips in half (along the original fold) to enclose the raw edges, press, then topstitch close the the edge. Lay the Insul-Brite on your work surface and position a backing square on top of it, right side up. Baste together with safety pins, keeping the pins toward the middle of the block where they won't interfere with the final seams. Lay a pieced block on top, right side down. 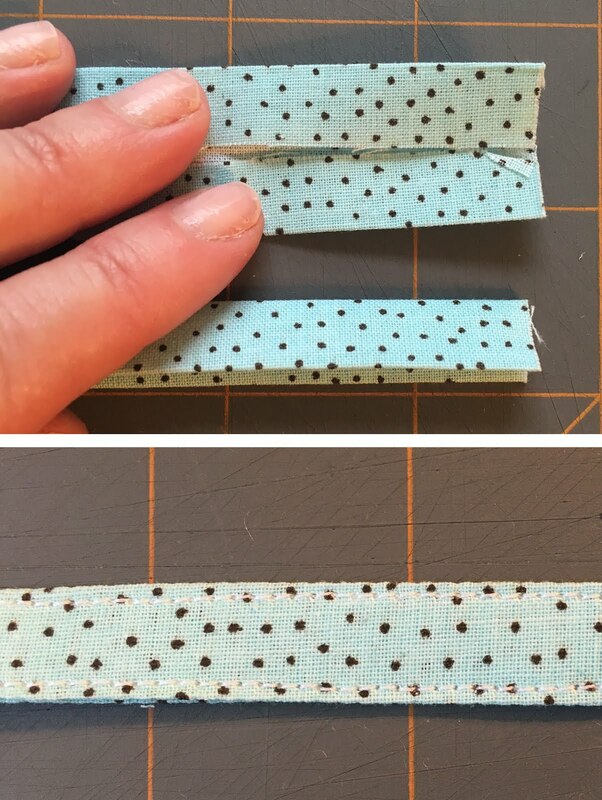 If you're adding a hanging loop, fold a loop piece in half and position it at one corner, between the two fabric layers, with the loop toward the center and the raw ends hanging out. Pin all the layers together. Sew all the way around the outer edge of the potholder with a 1/4" seam, leaving an opening along one side for turning. Trim the corners to reduce the bulk and carefully turn the whole thing right side out through the opening. Use a chopstick or something similar to gently poke the corners into shape and smooth out the Insul-Brite. Remove the safety pins, press on both sides and hand stitch the opening shut. 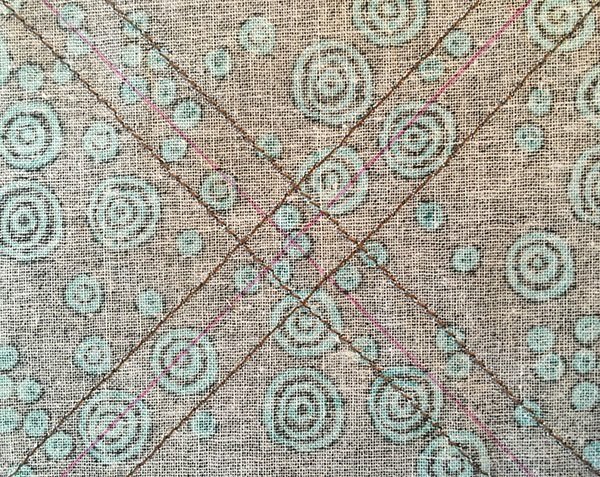 To keep the Insul-Brite from shifting around over time, add a few lines of quilting. 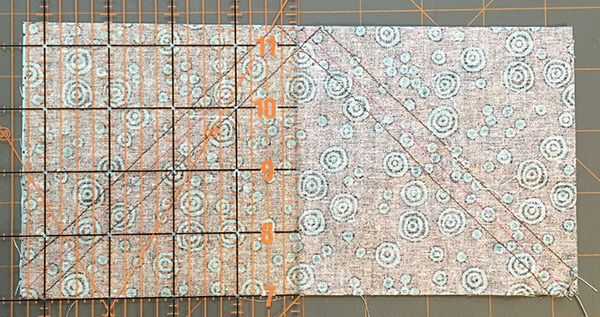 You can go crazy and do free-motion quilting, or stick with simple lines. I stitched in the ditch along the seam lines on my potholders but this is a great project for experimenting. I originally picked the fabrics for these to match my funky not-quite-blue-and-not-quite-green countertops. Once I got the first set of blocks assembled they started to remind me of the colors in my friend Suzy's brand new kitchen, and by the time they were all done they'd officially become Suzy's potholders. They're now on their way to her as a kitchen-warming gift, and I have an excuse to go looking for fabrics for another set since I gave these away. Everybody wins!